I celebrated my birthday the other day. The typical question one is asked is “well, what did you do on your birthday?” I went on a mission to check out a couple of projects up north. I did not want to stay on the PRT dwelling on the fact that I just turned thirty-seven. My day started really early and rushed. When I woke up I only had thirty minutes to gear up and get in the Hummer. 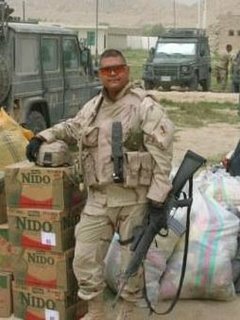 I threw my stuff on, ran out to where the trucks lined up, threw my rifle and helmet in, then ran into the DFAC to grab breakfast. In a paper bowl I threw in eggs, biscuits and gravy, and a sausage and took it back to the vehicles. About that time we started the final safety brief. I was able to scarf down breakfast before we left. That was a good thing because eating inside a bumpy vehicle with full battle rattle on would have been difficult. It was a long ride and it was cold that day. When we got to our destination and got out I about froze. It was bloody cold up there! We were at a higher altitude and it was really windy. I thanked my judgment for telling me to wear my polartec longjohns and my neck gator. In any case, after walking around I warmed up a bit but not much. I ate a food bar for lunch because I just couldn’t stomach the idea of eating an MRE. We weren’t expecting to but we actually got back in time for the staff meeting (we hold them twice a week). I slammed together some notes (I was gone all day) and briefed my portion. Typically, when you are finished you say “pending your questions I have nothing further”. My commander said that she didn’t have any questions but that she was glad that I was back in one piece because I went on the days mission and she wished me a happy birthday! I had planned a special dinner for myself. Good thing because dinner at the DFAC was less than appetizing. I had waiting for me a can of highland beef haggis, a tin of single malt whisky cake, and raspberry oatmeal shortbread from Caledonian Kitchen. I killed the haggis and had a third of the whisky cake (it took me three more days to finish the cake). The only thing missing was a couple of rusty nails (drambui and scotch whisky). I am still eating the shortbread. Thursday nights we all get together and play poker. After dinner I joined the poker game. It’s mainly the commander and senior staff that plays but it is open to anyone. It is a really good time to just hang out and BS, smoke cigars, and give each other a hard time. I came away from the game with a new nickname. The Sergeant Major started calling me the Outlaw Josey Wales because I was smoking small cigars like the ones that Clint Eastwood favored in so many of his westerns. Josey Wales chewed more tobacco than smoked it but I wasn’t going to argue with the Sergeant Major! Everyone had to say what was their favorite Clint Eastwood movie was and I named two, High Plains Drifter and Unforgiven. After poker, I hit the rack and that was that. I would have much preferred to play with my sons and be with my bride but I made do. Next year I think I will carry on with the haggis and whisky cake and definitely I will have those rusty nails.